Looks like Barnes and Noble is now selling Star Wars Destiny. I ended up buying the remainder of the box and pulled a Palpatine and a Force Lightning. It's nice to see a game I love being sold at more places than just gaming stores. 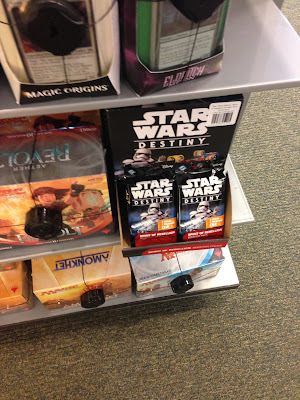 Then again, Barnes and Noble has a good history with FFG games. For those of you who are not located in the United States, Barnes and Noble is a big box book store that has a couple of shelves dedicated board games. The Magic the Gathering stuff you see is pretty much their entire stock. My take has always been that they stock one or two of each to sell to kids who come in with their parents and don't want books.